Incoming NorthEast United manager César Farías has added to his squad’s striking power with the signing of Portugese international Simão Sabrosa. Simão, 35, was confirmed earlier as the club’s marquee player for the 2015 ISL season. 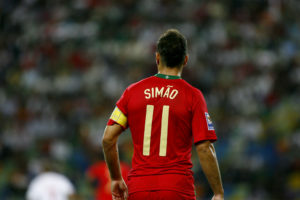 Simão made over 80 appearances for Portugal during his 12-year international career, including two World Cups, two European Championships, and a World Cup semi-final berth in 2006. The winger made his name across Europe playing for the likes of Sporting, Benfica, Barcelona and Atlético Madrid, scoring over 150 goals in all club competitions. NorthEast United ended the 2014 season at the bottom of the ISL ladder, with only three wins in 14 games. The club, co-owned by actor John Abraham, will be looking for a much better performance this season with their impressive international signings.